Th electrician did NOT solve the power problem. Grrr. So I am not having my Mac on unless I am sure I won’t turn off the wrong light switch and blow the circuit. 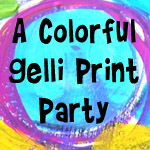 I have been wanting to play with my Gelli plate since the WOYWW crop and Fairy Thoughts Janet mentioning a technique with packing tape. Can I find my two big rolls of clear tape? Of course not. 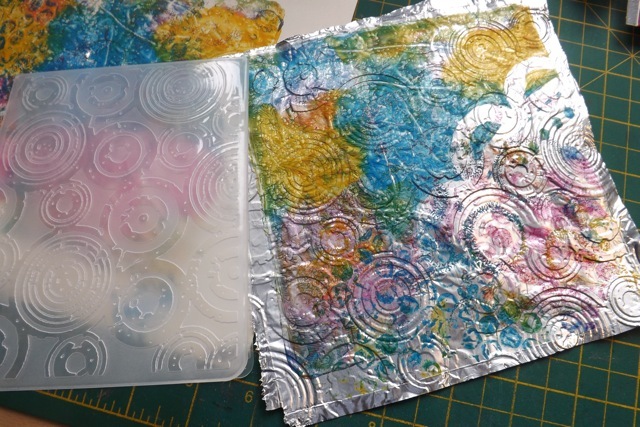 I’m sure I will but in the meantime, I did something I’ve been itching to try – printing on tin foil. I have some very heavy weight foil and thought it might work well. 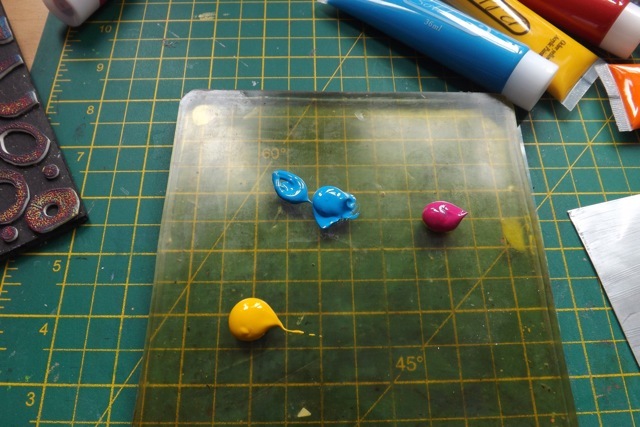 First I smoothed the foil over a square of heavy cardstock, just to give it some stability. I painted over it with matt glaze medium – I wanted to give the foil some tooth and didn’t have transparent Gesso, only white, so I improvised. 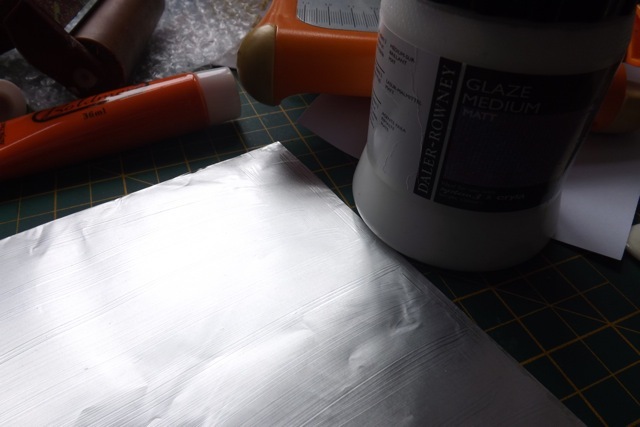 As you can maybe see, the foil retains a bit of metallic sheen, but not total shine – I would say it’s more like the dull side of the foil with the glaze on it. Loaded the plate and decorated it. I made sure to do at least part of it where the bare plate was on show, and used a stencil then printed through that, techniques to preserve at least some of the foil shine in areas. I also pulled a print from the plate after the foil print. You can see where the foil was folded around the cardstock on the edges. I slipped the foil into an embossing folder, but didn’t emboss it, just squeezed the folder together and rubbed. It gave me a more gentle texture. 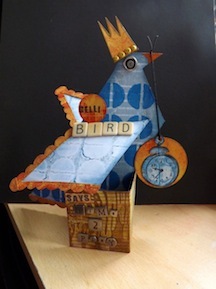 I think had I left the foil on the cardstock, then embossed it, it would have been sturdy enough to use the piece on a card, or stuck to a canvas, although peeling the foil away from the supporting card means it is very flexible so could easily be used to cover something curved. As I type this I can see what I think is one of the rolls of clear packing tape peeping out from under a pile of rubbish on my desk. So I may get to try that out after all! Tomorrow, DD want’s to try putting some colourful highlights in her hair – I unearthed a handful of Kool Aid packs I had bought for dying yarn. A couple of the ones I have left may work with DDs darker hair, so we will give it a go. Since it’s temporary and will wash out, and not “chemical” at all, we should be fine. I suspect it’s more likely that the colour impact will be very slight without bleaching her hair first, and that is not something I am prepared to do! 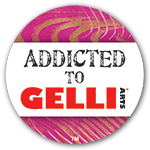 Categories: art, Gelli plate monoprints | Tags: art techniques, Gelli plate, how-to, Tin foil | Permalink. Wouldn’t this look good on the altered book? Thanks.